"Battle Stations! Battle Stations! Your country is being attacked. 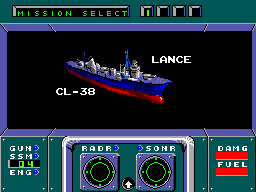 You'll be fighting on the U.S.S. Poseidon; an armor-plated attack cruiser with radar, sonar, 76mm cannons and surface-to-surface missiles. First come the training rounds. They'll throw everything they have at you..jets, cruisers, torpedoes, cannons. And then the fun really starts! Combat missions! You're on the open seas. You have blips on the radar. Line up your gunsights and let'em have it. You pick up an enemy cruiser on your and send them to Davy Jones locker. If you complete your missions, you will be awarded with the Navy's highest honor...a promotion to Fleet Admiral. 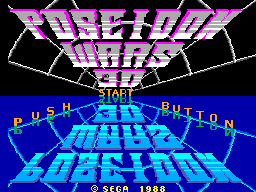 Best of all, you can play it in SegaScope 3-D or in 2-D. So everyone can play. But command the Poseidon well, or the enemy will send you to the briny deep!" To continue, when you see the "Game Over" screen press the directional pad Down four times,Right three times, Up two times and Left one time. You will start on the last level you played. 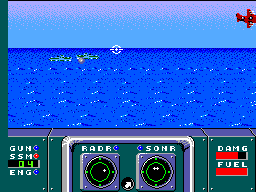 At the title screen, press the directional pad Up one time, Left two times, Down three times and Right four times. Listen to the sounds by pressing Button 1 after selecting them.